Taylor Walker pub in Tooting. 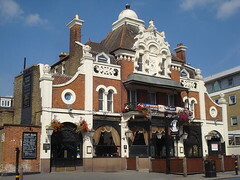 It's housed in a rather grand Grade II listed late-Victorian building on Upper Tooting Road. The main entrance opens into a large seating area, dominated by the brass-railed oval bar and made lighter and brighter by a large rectangular skylight. Corridors to either side bear original tiling photo, the bar back is carved wood, and etched glass is everywhere photo. Checkerboard tiling surrounds the bar, with patterned carpeting elsewhere. A swag-curtained opening leads through to the wood-panelled "sports zone" with flatscreens and a pool table. The rear patio garden is also accessed through here; there's another patio area at the front. Kake first visited on a Monday lunchtime in September 2014. I was the only customer at noon (just after they opened), though a couple more had arrived by the time I left 20 minutes later. Music was playing, not quite too loud. The flatscreens were showing sport with the sound off. On Kake's second visit on a Thursday afternoon in April 2016, it was similarly fairly empty, and the music and flatscreen situation was the same as previously. On our September 2014 visit they had four handpumps, with three on, offering Sharp's Doom Bar, Sambrook's Wandle, and Hogs Back TEA. They also had a bag-in-box of Westons Rosie's Pig behind the bar, and drinks on keg fonts included Samuel Adams Boston Lager and Meantime LPA. By the time of our April 2016 visit they'd installed another four handpumps, and they had on five real ales (Old Speckled Hen, Greene King IPA, Sambrook's Junction, King's Head Pale Ale [brewed for the pub by Sambrook's], and Camerons A-Hop-Alypse Now) and two real ciders (Old Rosie and Rosie's Pig). A pint of lime and soda was £1.29 in September 2014 and £1.35 in April 2016. Fairly standard pub food is served from a chain-wide menu photo of a selection from the menu in September 2014. They have WiFi via The Cloud, which is free but requires registration. Accessibility: A tiny step to get in, around the height of a typical kerb cut; the same size step to the front patio (three steps to the rear patio). Accessible toilet on the same level (reached via the "sports zone"); the ladies' is also on this level (gents' not checked). Last visited by Kake, April 2016. Opening hours taken from the 2015 Good Beer Guide. Last edited 2016-09-18 15:42:45 (version 6; diff). List all versions. Page last edited 2016-09-18 15:42:45 (version 6).